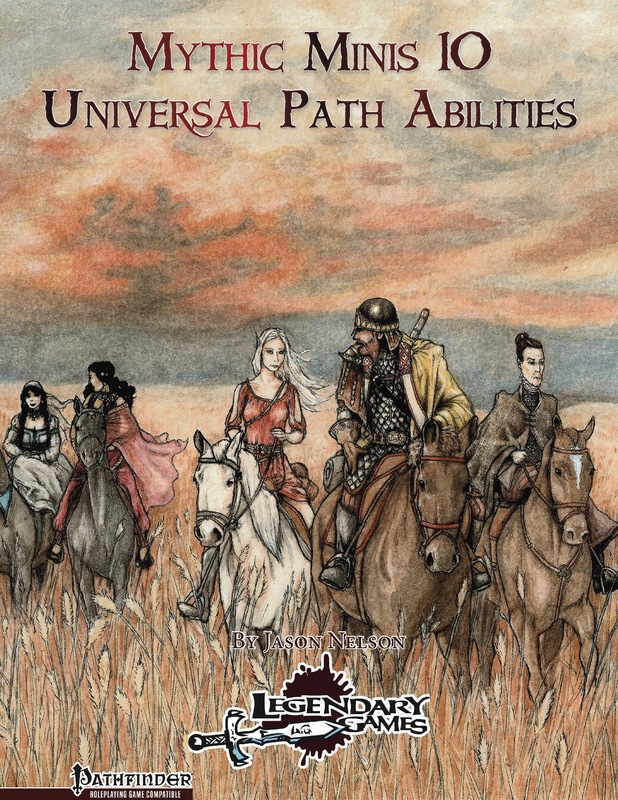 The tenth in our series of Mythic Minis, Universal Path Abilities brings you 6 brand-new mythic path abilities for mythic characters of any path, from Bound by Honor to Bon Vivant and Genre Savvy to Spectacular Death! This time, we're all about universal path abilities, so let's check this out! First, we're on to 4 1st tier abilities, with "bound by honor" allowing you to take monk's vows and thus use mythjic tier to increase ki-pool (or mythic power), saves and also improve quarry, challenge and similar abilities to represent your convictions guiding you. Nice. "Ever Ready" makes you more efficient in surprise rounds and against readied actions, which is actually rather fitting for a mythic ability and manages to convey the mythic flair rather well, in stark contrast to many a passive mythic ability. "Genre Savy" is imho the better (not in power - in execution) "Analytical Eye" - by making knowledge checks to identify creatures, you can use mythic power to temporarily ignore DR and resistances - and all sans requiring those pesky metagame aspects. Neat!! "Versatile Skill Mastery" nets you advanced skill mastery as per the advanced rogue talent, but also improves with your tiers, allowing for quicker switching of the skills. Now that one, while bland on paper, is very strong and feels rather mythic to me. Neat! The one 3rd tier ability allows for free extravagant living and bonuses to gossip-related skills/information. Okay, but nothing to write home about. 6th tier also gets one ability - "spectacular death". Okay, so far, the abilities herein lacked issues, but also didn't utterly wow me. This one, though, is glorious: It codifies action types and assigns costs of mythic power to each. Upon dying, you can expend mythic power (with cumulative costs for repeated action types) to go down in a vast, action-limit/economy-breaking blaze of glory. And yes, the wording is concise enough to support this - including anti-teleportation caveats and an inability to prevent your own death. This ability is beautiful, glorious and exemplifies what high-level mythic games should be about - the superhuman, truly iconic bursts of grandeur. This ability alone is worth the price of admission for me. Editing and formatting are top-notch, I didn't notice any significant glitches. Layout adheres to Legendary Games 2-column full-color standard and the pdf has no bookmarks, but needs none at this length. It should be noted that the one page of content has some blank space on it that could have been used for 1-2- further mythic abilities. Just when I was resigned to keep hating the path-ability Mythic Minis, this one comes along - sans lame metagaming, sans problematic mechanics and with a stunningly awesome "Blaze of Glory"-style ability. Jason Nelson delivers this time around with a truly neat mythic mini. My only gripes here would be the blank space and the somewhat uninspired 3rd tier ability, making this still by far the best path-ability-pdf of the Mythic Mini series so far. My final verdict will hence clock in at 4.5 stars, rounded down to 4 by a small margin. Now available! The perfect path abilities if you whether you want to live or die in a way that will be LEGENDARY! I see the plans for mythic minis has changed. I thought 9 and 10 were set to be stealth feats and archmage abilities. Will these be the next two? I'll be posting about that on our site shortly. Long story short, when you've got a long series of products, sometimes inspiration shifts a bit from here to there. Sometimes feat ideas in one area work better in other areas (like some of the Stealth ideas actually worked better as Feats of Terror - sneaking up and BOOOOOOO!!!!! ), and in the case of Archmage, I just had a pile of ideas bubbling up about Universal stuff. Fear not, though, plenty more goodness is on the way! No fear here. I will be glad personally to see more in the line. I absolutely adore Bon Vivant. I've loved each of the Path mini's. Each one has had at least one thing I think the book is worth. Thanks for the kind words, L.M. If you could take a few minutes to write up a review, we'd be most grateful!